My three children have endured three long deployments without their daddy. Supporting military kids is very real to me. Our family has benefited from those who have it on their heart to reach out to military kids with good quality books. Contrary to what many believe, there are MANY books for military kids (LINK to my lists). And now I am delighted to highlight some NEW military children books! 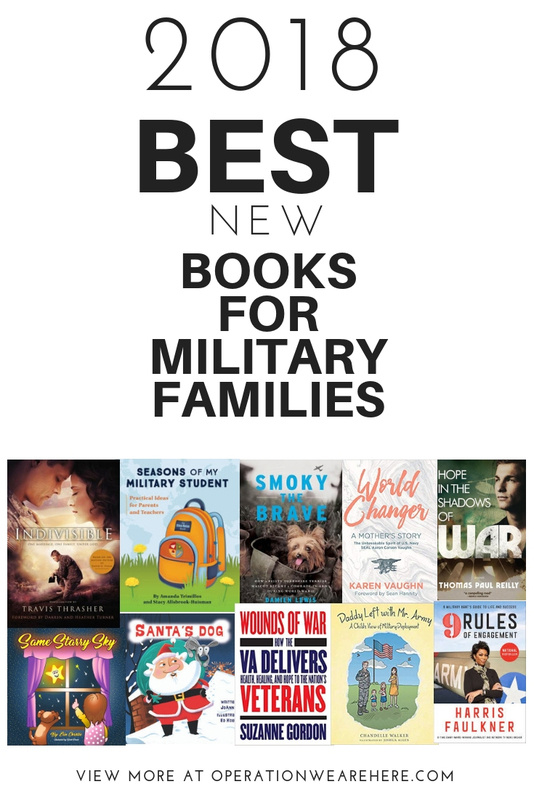 More BEST new books for military families! Military-connected students move frequently, changing schools as many as nine times from preschool to high school graduation. With each move, they adjust to a different curriculum, meet new teachers and coaches, adapt to a new learning environment, and develop new friendships--all amid other military life challenges, such as a parent's deployment. In this rhyming story, readers follow the adventures of Santa's best dog, Lance, when he falls out of the sleigh one Christmas Eve. He's taken in by the animal shelter and then brought home by a military family who needs some help as Dad is called to serve his country. 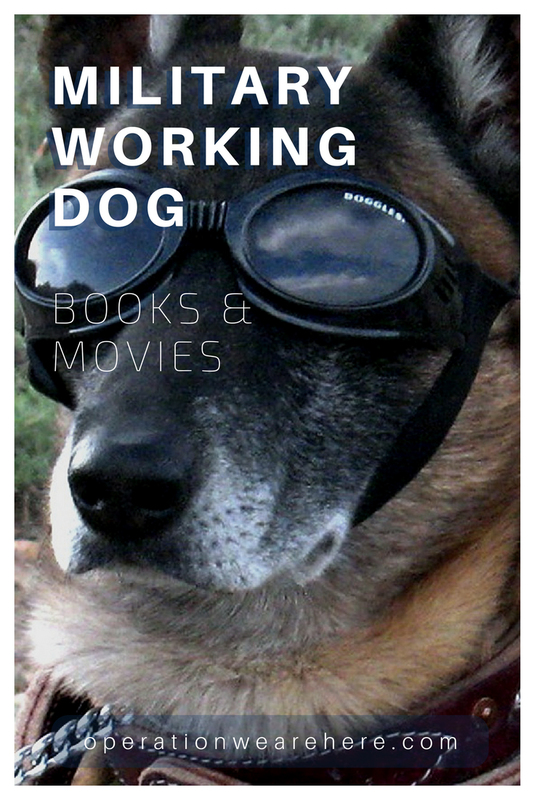 A sure favorite for anyone who loves dogs, in particular rescue dogs, Santa's Dog is a heartwarming tale for youngsters and the young-at heart. Take a look into the world of military children with their struggles, desires, and enduring love and support for their parent who is far away. This book is narrated by children who are missing their dad and feeling alone. But through the loneliness, the children recall good memories, are reminded of the importance of daddy's job, and most importantly, constantly reminded that they are still loved despite the distance! This children's picture book was written by a military spouse to help children communicate their feelings during military family separation and focus on the positive aspects. Multi-cultural military kid’s picture book. Kids! We Have PCS Orders! is fifth in the Deployment Series of books by author James R. Thomas. This story was written specifically for military families with kids preparing to go through a PCS (Permanent Change of Station) move. Illustrated in color, the picture book tells the story of a how a military family prepares the kids mentally for the move. The author, through his own experiences, has written a story he hopes will make your PCS a little easier. The story helps facilitate discussion with your child before or after you receive the PCS orders. The author intentionally did not reveal too much detail in the storyline in order to leave room for the readers to ask questions and generate discussions. Even in the title, the unique service-related acronym PCS was used to allow readers to discover through the story what PCS means. The characters are multi-cultural, dual military parents, with the mother dressed in a naval uniform and the father in military camouflage. Kids! We Have PCS Orders! Apply with confidence and write a winning resume. A quick and easy guide to find a federal job. Discover proven secrets and get a job. Skip the frustration and apply successfully on USAJOBS. Learn about the Federal hiring process and Federal resume writing techniques. Qualify for the job you want, interview to win and get the salary you deserve. Living as a military child can often be challenging. Have you wondered what a military deployment is like from the eyes of these children? Have you thought about what they might be feeling, and do you question how to help them get through it? In Daddy Left with Mr. Army, author Chandelle Walker offers insight from a child's perspective to help you understand the emotions your child may be feeling as a separation occurs. Based on Walker's personal experiences in a military family dealing with deployments, Daddy Left with Mr. Army helps both children and parents open a conversation about the time away. Through rhyme and illustrations, this picture book shares the challenges of deployment but also the joys of serving the United States in the military. On August 6, 2011, 30 American soldiers aboard Extortion 17 perished in the single greatest loss of Navy SEAL lives. Among them - Aaron Carson Vaughn, a small-town boy who grew up in the hills of Tennessee and lived a life larger than most. Told through the eyes of Karen, Aaron's mother, this tender story of faith, family, and love grips the heart and shows how one family raised an American warrior filled with courage, tenacity, and patriotism. The Vaughn's story is not one about war or about a grieving family, but rather one of triumph and God's sustaining grace. Woven throughout Karen's story is practical advice for today's parents. Also included at the end is a study guide for those who desire to go deeper and learn how to raise children who live life so well that they leave a legacy. U.S. military conflicts abroad have left nine million Americans dependent on the Veterans Health Administration (VHA) for medical care. Their "wounds of war" are treated by the largest hospital system in the country―one that has come under fire from critics in the White House, on Capitol Hill, and in the nation's media. The resulting public debate about the future of veterans' health care has pitted VHA patients and their care-givers against politicians and policy-makers who believe that former military personnel would be better served by private health care providers. This high stakes controversy led Suzanne Gordon, award-winning health care journalist and author, to seek insight from veterans and their families, VHA staff and administrators, advocates for veterans, and proponents of privatization. Gordon spent five years closely observing the VHA's treatment of patients suffering from service related injuries, physical and mental. In Wounds of War, Gordon describes how the VHA-tasked with a challenging patient population- does a better job than private sector institutions offering primary and geriatric care, mental health and home care services, and support for patients nearing the end of life. The VHA, Gordon argues, is an integrated health care system worthy of wider emulation, rather than piece-meal dismantling for the benefit of private contractors. In the unusual culture of solidarity between patients and providers that the VHA has fostered, the author finds a working model for higher quality health care and a much-needed alternative to the practice of for-profit medicine. Inspired by true events, Indivisible is a story of love, service, and finding each other all over again. Darren and Heather Turner share a passion for serving God, family, and country. When Darren is deployed to Iraq as an army chaplain, Heather vows to serve military families back home as she cares for the couple’s three young children. Darren knows he’s overseas to support the troops in their suffering as their chaplain. What he doesn’t know is how he will get through his own dark moments. And as communication from Darren dwindles, Heather wonders what is happening in her husband’s heart. Meanwhile, she’s growing weary in the day-to-day life of a military base—each child’s milestone Darren will never see, each month waiting for orders, each late-night knock on the door. When Darren returns, he is no longer the husband Heather once knew. She is no longer the woman Darren wed. And so it’s at home that the Turners face their biggest battle: to save their marriage. Based on the screen play by David Evans, Indivisible is a tribute to the beauty of serving our country, the courage of choosing love in the darkness, and the power of a God who never gives up hope. Marriage is worth the fight. Equip yourself for the journey with Indivisible: One Marriage Under God, a powerful new devotional. Indivisible is based on the movie Indivisible, which tells the true story of Army Chaplain Darren Turner and his wife Heather's battle to restore their marriage. The devotional offers couples inspirational devotions, prayers, guided journaling, and a Take Action challenge. It is great for any couple who wants a strong marriage under God. As Darren says in the film, 'When you invite God into your marriage, your marriage is so much better," and Indivisible: One Marriage Under God is the perfect way for couples to do that in the midst of life's ups and downs. The Indivisible devotional offers 50 in-depth devotions that include a marriage-themed message, Scripture, a prayer, guided journaling, and a Take Action challenge. Indivisible: One Marriage Under God is practical for any couple who wants to deepen their relationships with God and each other. With a foreword written by Army Chaplain Darren Turner and his wife Heather, Indivisible: One Marriage Under God offers hope and grace for even the most challenging situations. This is the perfect gift for military families, newlyweds, and those looking to strengthen the foundation of their marriage. Invite God into your marriage and experience His incredible power in your daily life with Indivisible: One Marriage Under God. The Emmy award-winning news anchor of Outnumbered Overtime with Harris Faulkner and co-host of the talk show Outnumbered shares the lessons she learned growing up in a military family paying homage to the military ideals that shaped her and showing how everyone can benefit from bringing the wisdom of military service into their lives. Born into a military family, Harris Faulkner revered her father, a decorated career officer who served three tours of duty in Vietnam and raised his children with the values and ideals of the U.S. military. Accompanying him from posting to posting, young Harris experienced firsthand how success in life was rooted in the knowledge, integrity, and leadership that came from her military surroundings. Indeed, these formative lessons in leadership and work ethic became the guiding principles for her career as a journalist, lessons she credits with her rise to become one of the top hosts on Fox News. Now, she shares the advice, wisdom, and tools that she absorbed through her military upbringing, examining how these ideals have shaped her professional and personal outlook and how everyone can incorporate them into their own lives. Using her father’s career as the backdrop to her experience, she explores the lessons in courage, duty, patriotism, and responsibility that helped her succeed, demonstrating the truth to the axiom that in military families everyone serves—together. Along the way she also interviews current and former military families, generals and other officers, and tells stories from her father’s career to illuminate how and why the message and mission of the military is so effective at changing lives both on and off the battlefield. Illustrated with sixteen pages of never-before-seen photos of her early life and career, this instructive book, part memoir, part motivational life guide, reminds us of our most important values—the keys to a successful life. Hug in the Wind touches the heart of every military family with this encouraging picture book of a parent's hug sent home wrapped in the wind. This story reads and rhymes smoothly with the sweetly simple message every child needs to hear when separated from a parent: I love you even though we are apart. Truly from the heart. Written and illustrated by a deployed father for his son's second birthday, this is a genuine story for any child braving the months-long separation endured by military families. A child needs only a star to let them know their parent is not too far. This holds especially true for a child with a parent in the military. These families face numerous transitions and challenges, and deployment of a parent can greatly affect all of them. Coping with the difficulties of separation, while trying to stay connected to someone you love and miss so much can be a daily struggle. Same Starry Sky is a story about staying connected. It illustrates the shared experience between a child and their parent that brings them together no matter how many miles may separate them. It can provide a source of comfort to both the child and their parent by offering a simple way to feel closer. Vietnam War veteran Timothy Patrick O'Rourke discovers the great paradox of war upon his return to the US. It is 1973 and he has left the war, but the war has not left him. He carries with him a profound sense of unfinished business, and struggles to find meaning amid days packed with the responsibilities of a life he no longer understands. Even with the patient, loving support of his girlfriend, Cheryl, Timothy cannot escape the shadow of war. Then he meets the mysterious Hoffen. A voice of tragedy, wisdom and hope, Hoffen has traveled through the darkness and emerged on the other side. Maybe, just maybe, Timothy can do the same. Timothy's odyssey is every veteran's story to some degree, with alienation, hyper-vigilance, substance abuse, relationship problems, guilt, flashbacks, nightmares, and depression as his constant companions. Hope in the Shadows of War confronts the stark realization that a wound that never closes can't heal, and it proves that while trauma casts a long shadow for survivors, hope is a powerful antidote. Rise Up Military Moms is an interactive journal aimed at helping you find strength and resilience whether you are sending your child off to a deployment, basic training or boot camp. NOTE: Rise Up is NOT a book for just reading. It's a guided journal to help you work on you as you travel this military mom journey. We give you weekly things to work on, think about and research to help enrich and strengthen your experience as a military mom. As a military mom, it can be an emotional roller coaster full of unknowns and fear. I often wished I had a guide to get me through those tough times. That's what Rise Up Military Moms is all about. With Rise Up Military Moms, you will have 6 months of weekly guided journaling. Each week features ways in which you can take action to awaken your strength, energize your spirit, and push through your fears. You’ll also find positive insights to inspire and uplift you through your military mom journey. There is also room for writing reflections, thoughts, and introspections. This journal is perfect for mothers of service members from all branches of the military: Army moms, Air Force moms, Marine moms, Coast Guard moms and Navy moms. As you go through this journal for military moms, know that you are amazing! You raised an incredible person that is a member of the best trained military in the world. A story about the challenging (and fun) changes a military family goes through when a parent is deployed. I think I am pretty lucky because I am part of a military family. It makes me really proud to know my parents are working to keep our country safe. I get to do stuff other kids do not. and I have looked inside a Humvee. Smoky the Brave is the extraordinary, touching, and true story of a heroic dog and her adoptive masters in the jungles of the Pacific War. In February 1944, as Japanese military advances threatened to overwhelm New Guinea, a tiny, four-pound Yorkshire Terrier was discovered hiding in the island's thick jungles. The GIs who discovered her thought at first she had been a Japanese army mascot, but it turned out that she didn't understand commands in either Japanese or English. A mystery, she was soon adopted by US Army Air Force Corporal William "Bill" Wynne, an air-crewman in a photo reconnaissance squadron, and became something of a lucky charm for Wynne's unit. When Smoky saved Wynne's life by barking a warning of an incoming shell as their landing craft approached an enemy-held beach, he nicknamed her the "angel from a foxhole." Smoky's exploits continued when she famously jumped with the unit in a specially designed parachute. But her most heroic feat of the war was running a cable through a seventy-foot pipe no wider than four inches in places to enable critical communication lines to be run across the recently occupied airbase of Luzon. Her efforts saved hundreds of ground-crew from being exposed to enemy bombing, preventing both injury and loss of life. In recognition of her efforts, and adding to her previously-awarded eight battle stars, Smoky was given the PDSA's Certificate for Animal Bravery or Devotion in 2011. In Smoky the Brave, award-winning war-thriller author Damien Lewis brings to vivid life the danger and excitement of the many missions of World War II's smallest hero.